Combines fantastic action with witty comedy in unique and creative fashion. Kung Fu Hustle is a stephen chow martial arts movie and it is an absolute blast. It starts out as a gangster movie, with one gang battling another in the streets. there’s comedy in there too, as the gangsters follow their brutal murders by doing a dance number back at their hideout. and all of this is to show that there is a ruthless gang out there, whom even the police are afraid of, and nobody to stop them. We move from the gangland streets into an area that is a slum known as pig sty alley, Here, the landlord is queen as she walks around in her bathrobe, cigarette in mouth, slapping people in the face and demanding rent. Her tenants are extremely poor and she shuts the hot water off on them while they are showering and does all sorts of other mean things. the reason for coming to this area is because supposedly this is the only area poor enough that the gangsters don’t care to bother with. Stephen chow and his heavy friend now come to the alley looking for work. of course there is none, and so he leaves empty handed, but not before he gets into a tiff with the landlord and then tries to throw knives at her. they all end up going the wrong way and hitting him instead. chow and the landlord now get into a chase that is cartoonish and reminiscent of the road runner and wiley coyote. especially in the way that like the coyote, none of chow’s knives went in the right place and all ended up coming back to hurt him instead. it’s all very funny. the plot continues on as the gang does come to pig sty alley after all and is defeated by three lone warriors who were in hiding among the peasants who lived there. these three men didn’t know each other, and it is only because the gang attack that their talents came out. one of them wears metal rings around his wrists which are great for both blocking and for striking an opponent. the gang retaliates by hiring two elderly lyre players who set down their instrument and begin to play. as they do, weapons like axes fly out of their instrument and kill the three lone warriors who have stepped up to help the town. but the lyre players are not able to get up and leave so easily. that’s because two new masters shed their cloaks and show who they really are. these are the landlords. the evil woman and her husband. turns out they’re not so bad after all and are very talented martial artists. they easily defeat the lyre players and save the people of their alley. 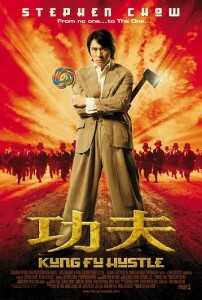 stephen chow now starts to get a much bigger part than he has had so far, as he goes to work for the gang. in the first half of the movie, he was there as a guy on the street looking for work, put into the movie solely for comic relief. his part was in the background to the story of the alley peasants vs the gang. 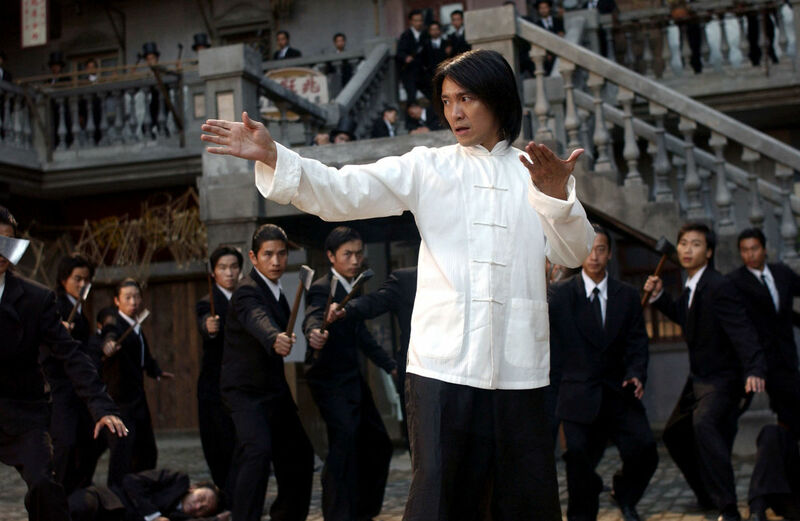 chow had some very funny scenes, like one where he challenges the weakest looking people in a crowd to a fight and every one of them emerges from the crowd looking twice as big or twice as strong as they appeared. watching chow back pedal over his words, now claiming that he meant somebody else and not the person who is standing in front of him waiting to fight, is very funny. so is a scene where chow insults a man with glasses on a bus and gets beaten for it. But in the second half of the movie, the focus becomes more on story and action than on comedy, and that’s okay. we’ve already got the comedy out of our system, and now it’s time to get at what the movie is really about. the gang hires chow to get a man named “the beast” out of prison. the beast is an elderly man in an undershirt and chow does as he is told and brings the beast to the gang. the beast now takes on the landlords in a tremendous fight that is more like superheroes battling superheroes than real martial arts. it doesn’t matter that the action is computerized here, this is more of a fantasy martial arts film than a serious one. chow steps in to help the landlords for some unexplained reason (maybe he realized something or regretted what he had done by busting the beast out of prison). and for the final portion of the film, we get the emergence of a new hero, who was really there right in front of us the whole time, and watch him take on the remnants of the gang. i love how this hero is wrapped up like a mummy after being injured and then emerges from the wrapping as if it were a cocoon. he has now been reborn and has the skills to show for it. his fight against the beast is terrific and it’s epic scope is an amazing way to end the movie. kung fu hustle works because it combines clever slapstick comedy with a fascinating story filled with remarkable action. i love the way the story continues to unwind with more and more surprises as it goes on.